When boilers are taken out of service for any length of time, corrosion may occur on the internal surfaces of the boiler unless certain precautions are observed. During periods of idleness, boilers may be laid up by one of two methods – Wet lay-up or Dry lay-up. The choice of method is dependent on how long the boiler is to be out of service and how quickly the boiler may be required back in service for regular steaming purposes in an emergency, etc. The wet method should be employed if boilers must be left idle with water in them prepared for emergency service if required. Do not use wet method if boiler will be exposed to freezing temperatures. 1. Prior to the lay-up, the boiler should be well washed out to remove sludge and any other deposits adherent to the metal. This is necessary to eliminate oxygen attack points and to remove bimetallic unions from metallic oxide accumulations in the sludge. 2. Following the washout, the boiler should be filled with the lowest solids water available. This is necessary to reduce the influence of anion and cation activity. The boiler should then be fired and chemical injection of the control materials accomplished. 3. A sulfite based boiler treatment should be feed to remove any dissolved oxygen and establish an excess of around 300 ppm of sulfite as Na2SO3. 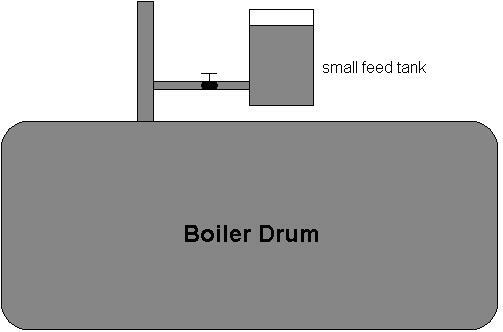 After allowing a reaction time of one hour, the boiler water should be tested to demonstrate that the excess of sulfite does exist. If such is not the case, additional chemical treatment must be added until a residual can be demonstrated. 4. Continue to fire the boiler until a pressure of 2 to 3 psig is established. Force feed until the boiler is flooded. 5. Establish a 5 gallon or larger water reservoir 2 feet above the safety valve in order to assure continuous positive pressure. 6. Allow the boiler to cool, maintaining a constant check on the water reservoir to assure a completely flooded system. 7. Check all controls and fittings to assure a tight, leak free system. 8. Check the boiler water at weekly intervals for sulfite content to assure 300 ppm level is maintained. 9. Every week the boiler should either be circulated to prevent chemical stratifying or the water level lower, the boiler fired, the chemicals readjusted and the boiler flooded once again.